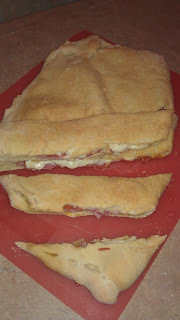 Hubby made Stromboli for dinner and it was oh so good! He rolled out the pizza dough, (we use Publix pizza dough,) and then stuffed it with ham, pepperoni, capicola, and of course...mozzarella! A little melted butter and Parmesan tops it off before putting it in the oven at 400 for 20 minutes.